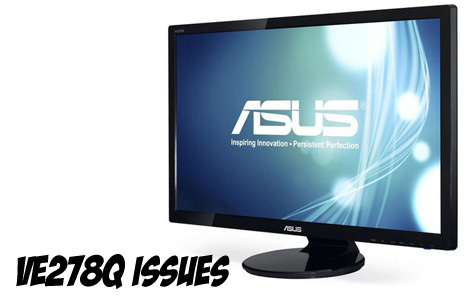 I’ve just found a solution to an issue that’s been plaguing me since the day I got my ASUS 27″ monitor. Occasionally, when moving it from one place to another (LAN party, moving houses, unplugging and tidying up cables etc) I have an issue with one of my two VE278Q’s turning on. At first I thought I had gotten the power cable for it mixed up with a smaller thinner power cable that wasn’t putting enough power through to boot up the monitor. I would turn the power button on and instead of it allowing me to change sources, the power LED would be white or a purple/violet color instead of the normal Blue=Good, Orange=No Connection. I would fiddle with it for hours and finally get it to work so I dreaded moving it or trying to set it up. There was one thing I overlooked though – the one causing me issues always had the Display Power cable hooked up to it and the one that was working fine had the DVI plug hooked up to it. I never really put two and two together and I needed one of them to use the Display Port since I have a third monitor (which I plan to replace with a third VE278Q soon) that required the use of the second DVI port on my ATI 6970. Thanks to this amazon review I figured it out. If you try to plug the Display Port plug into the monitor before you turn the monitor on, your power button LED will be white or purple in color. The solution is to simply unplug the Display Port cable from the monitor, unplug the power cable from the monitor, wait a few seconds and plug the power cord back in and then plug the Display Port cable back in. Like the Amazon review puts it “this is a big hassle”. It’s not going to keep me from buying a third one when I can afford to spend another $350 on a monitor, but it’s something that the owners manual doesn’t even acknowledge. As a matter of fact, the owners manual doesn’t even mention a white or purple LED as being a possible state of the power LED. Huge oversight on ASUS’ part. Hope this helps some other folks out there trying to google “ASUS 27″ VE278Q white LED” or “ASUS 27″ VE278Q purple LED”. God knows I spent a good 30 minutes to find that amazon review. Cheers and enjoy your ginormous screen! I am having the same issue with two VE278 monitors I bought. I even took them back to the store and had the technician look at me like I’m incompetent when it powered up fine. Anyhow I will try your suggestion tomorrow and I think it will work to correct my issue, which is Display Port plugged in before powering on. Does this mean I have to unplug the DP everyday I turn my PC on? Is there a MANUAL about for this model?? Hey dave, sounds to me like your resolution is off on your computer. Going to take a guess and assume you’re on Windows 7. Go to Start -> Control Panel -> Display -> Adjust Resolution (left side) and make sure you’re running 1920×1080. If you’re not, you may want to find new display drivers (search for your brand of video card or if you don’t have one then your motherboard). If you’re running Windows XP it’s just right-click the desktop and go to Properties and change the resolution there. This is exactly the case. I have 4 of these and it is the same with all of them. Oh tod. The only time this is an issue is if you unplug the monitor or turn it off with the button. I almost never do this. So after you have your setup you should be good. The big problem with the monitor is the display port cables. You need really strong ones for them to work without issue. There is a list of approved cables someplace. Thanks a million for the post. Work exactly as you said. I bought my second monitor on KIjiji. I thought I’d purchased a lemon. I was ready to go “postal. You saved two people today…me and the poor guy I was about to go off on.